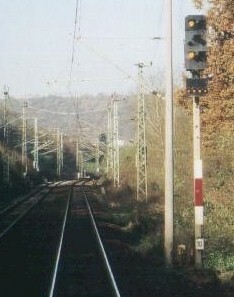 An Hl signal on the Line to Meiningen, Thuringia showing aspect Hl 12a: line clear with 40 km/h, expect stop. Below the main head you see a Zs 2: direction indicator. 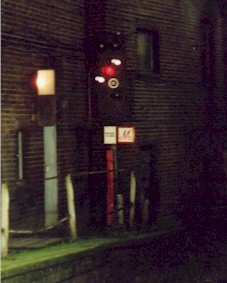 The white board with the letter "K" is the signal identifier, the white-red-white post plate tell us that this signal must not be passed at danger. Another Hl signal at Rostock showing aspect Hl 3a: clear with 40 km/h, expect clear with maximum speed. Also you can see a Kreisscheibe (Circle Board) between the head and the post plate. Hl 3b (clear with 60 km/h, expect clear) at Bad Kleinen. 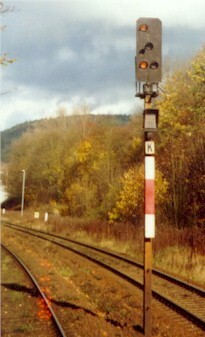 Also this signal is equipped with a Kreisscheibe. 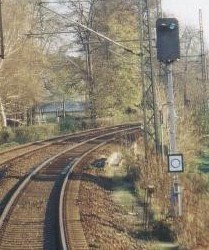 Note that the post plate is mounted to the right of the post, because the departure signal (the black box left to the post plate) is mounted centred at the post. The plate with the number 140 is the signal number. An Hl distant signal showing aspect Hl 1: expect clear. 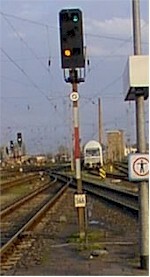 An Hl signal at stop, shunting allowed (Hp 0 + Ra 12) on Berlin's S-Bahn at Warschauer Straße. Hl 12b: Clear with 60, expect stop. An Hl distant signal repeater (as indicated by the post plate) showing 'expect clear'.